Keep wild animals out of your garden or backyard using the Havahart Spray Away Motion Activated Animal Repellent. This clever item uses a combination of movement, sound, and a short burst of water to deter marauding animals from your area. These techniques create a memorable and slightly unpleasant experience for the animal, teaching them to avoid your yard. An infrared sensor and adjustable eye occupy the front of this unit, activating it only when an animal passes through its field of vision. Set the sensitivity knob on the back of the item for the size of animal you wish to deter, and angle the eye appropriately for added effectiveness. The included stake brings stability and height to this repellent, enabling it to stand alone in your yard. Attach your garden hose to the threaded port, providing a water source for the top sprinkler. 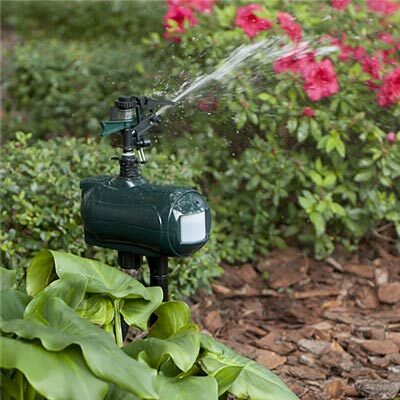 The top knob on this versatile sprinkler allows you to set the distance for the water, and the metal tabs on the base can be adjusted to spray a wide or narrow arc. Based on your water pressure, the spray can extend up to 35' away, and up to a 50' wide arc. The sprayer uses 4 AA batteries (not included) for power, and its lasting plastic casing will withstand use for many seasons. Stop wildlife from destroying your flowers and vegetables with this Spray Away Motion Activated Animal Repellent. Assembly required. Two year limited warranty.